We are back from West Virginia! Diana and I just got back from our longest motorcycle journey yet. A five day trip to West Virginia with 17 members of First State HOG. We covered over 1200 miles of the most amazing roads and had perfect weather. No rain, that’s a first for this year! 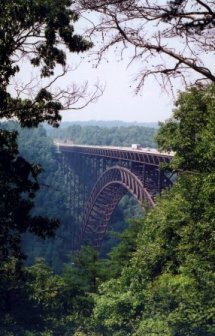 Yes, we crossed the famous New River Gorge bridge, twice! Then we went under it! It’s the longest single steel arch bridge and second tallest vehicular bridge in the world. We were at the top of Cheat Mountain, the second highest point in West Virginia at 4848′ high. Diana sat in the biggest Adirondack chair we have ever seen. We met the biggest Motorcycle Blues musician in the world. We saw lots of wild critters and a crazy biker puppet give a women oral pleasure! We saw an SUV loaded into the back of a dump truck. I got stung by something in the inner thigh while riding sweep. I don’t know if it was a bee, a wasp or a hornet. I just know it didn’t tickle and I have a big purple welt on my leg. Another one of our members got stung in the finger as he pulled a bee out of his helmet while riding. Yes it was a memorable trip and we have lots to tell you once we download all the pictures and get our thoughts straight. We also tested several new products we look forward to telling you about. We owe special thanks to Triple S Harley Davidson in Morgantown, WV who stayed open past their closing time to accomodate us. One of our riders was having a technical malfunction on his 2008 105th edition Screaming Eagle Ultra Classic miles and miles from home. Also, we have a t-shirt addict among us who must buy a new t-shirt at every Harley Davidson dealership along the way (even if he already has a few from that dealership already). We were running late and Triple S waited for us. They fixed our friends motorcycle and let us buy all the t-shirts we wanted. I even got one! Special thanks to Lem McMaster for showing us the most incredible roads we have seen so far and leading us safely for 5 days straight. I also want to thank the other Road Captains, Road Captain Prospects and members who ran wing and sweep during our trip. It was a great time that Diana and I will remember for the rest of our lives, and that’s what it’s all about!